August 15, 2017 – Canadians celebrate Acadia! Baldwin – La Fontaine: Toward Responsible Government project was launch on November, 2017 as part of the Canada 150 celebrations. With this initiative, the Foundation hopes to inform Canadians about responsible government and to kindle their interest in this political process. Although the achievement of responsible government was a key moment in our country’s history, it is poorly understood by many citizens. The implementation of responsible government was one of the events that led to Canadian Confederation in 1867. Responsible government refers to a government that is accountable to the people rather than to the Crown. 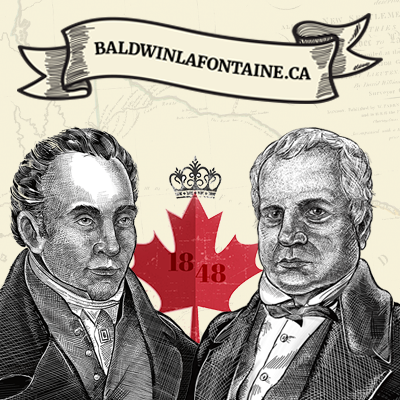 The project allows us to discover a series of documentary films to discover the role played by Baldwin and LaFontaine in shaping Canadian government as we know it today. The Foundation was created in 2004 by the Fédération des communautés francophones et acadienne du Canada. Who were its key architects? How was it achieved in Canada? Why was it necessary or beneficial at the time? How did responsible government contribute to the creation of modern Canada? To view the documentaries, click here! Based on the content of the documentaries, we developed a Learning Activities Guide aligned with high school-level curriculums. Activities can be used in French, English, (reading, writing, oral communication) or social studies classes. The Foundation gratefully acknowledges the financial support provided by the Department of Canadian Heritage.